4:58 PMShortly after Oprah Winfrey delivered a galvanizing, inspiring speech about visibility and accountability while accepting her Cecil B. DeMille Award at the Golden Globes on Sunday night, the internet started gushing over how presidential she sounded. “Nothing but respect for OUR future president,” NBC (not NBC News) tweeted before deleting. Then people started speculating about whether she actually would run for president and arguing about her competence for the office. But this conjecture unfortunately takes away from the power of Oprah’s speech as its own self-contained, and completely necessary, call to action. Her speech wasn’t about her at all, which is what made it so impactful. She, instead, used her platform and visibility to draw attention to exactly the kind of women who are often shunned and ignored in our society. The most vulnerable among us. The ones who can’t say #MeToo and #TimesUp and speak their truth without experiencing devastating consequences. She lifted those women up in her speech Sunday night, and she also asked men to take an active role in shutting down the cycle of abuse that happens in Hollywood, in media, in academia, in factories, in just about every part of society one can think of. Before we breathlessly move on to The Next Big Thing in our news cycle, let’s make sure we take a moment to internalize what Oprah told us Sunday night and appreciate the moment for what it was: not the start of a run for the presidency but a night when a black woman, while being honored with a prestigious award, used her platform to tell vulnerable communities that they are seen. 12:06 PMErin Jackson, who took up speedskating just four months ago, qualified for an Olympic roster spot on Friday, becoming the first black woman on Team USA in long-track speedskating and the second ever to make an Olympic speedskating team. Jackson, 25, came in third in the 500 meters at the U.S. speedskating trials in 39.04 seconds, a personal best. She finished behind veteran Olympians Brittany Bowe (38.18) and Heather Bergsma (38.42). The Ocala, Florida, native was an inline skater for 15 years and started speedskating in March 2017, but she’s consistently trained on ice only since September. At the 2018 Winter Olympics in Pyeongchang, South Korea, Jackson will join 17-year-old Maame Biney, who in December became the first black woman to qualify for a U.S. speedskating team when she won the 500 meters at the short-track trials. Four-time Olympian and two-time gold medalist Shani Davis qualified for the U.S. men’s team on Wednesday after he finished second in the 1,000-meter race at trials. She’s married to Golden State Warriors star and two-time NBA champion Stephen Curry. She just opened her flagship restaurant International Smoke in San Francisco, her third location with chef Michael Mina. The 28-year-old’s show Ayesha’s Home Kitchen was launched in July 2017, and she was also a co-host of ABC’s The Great American Baking Show. She’s an author and one of the new faces of CoverGirl, has a cookware line and a home cooking service and is the mother of two daughters, Riley and Ryan. Their courtship began in 2002 as a church friendship when they were 14. Curry’s family joined the Central Church of God in Charlotte, North Carolina. Retired NBA player Dell Curry and his wife, Sonya, along with their three young children, Stephen, Seth and Sydel, were members of the church as well. The couple wed in 2011. “One thing that my mom always told me was to never lose yourself inside of your marriage. I’m happy that I’ve been able to find that so-called balance and be able to pursue my passions and take care of my family,” Curry said during the Nightline interview. According to ABC News, Mina says Curry is “really humble.” “Everything that she wants to get out of this industry, it’s all about this idea of how you continue to create just great food for your family, for your guests,” he told Nightline. 1:53 AMAs an African-American explorer in the late 1800s and early 1900s, Matthew Henson donned warm coats with fur collars while braving frigid temperatures during his journeys through the Arctic to the North Pole. Many students in Baltimore’s Matthew Henson Elementary School are donning similar cold weather gear while attending class in 2018. We know about the dilemma of those students thanks to former NFL linebacker Aaron Maybin, who teaches at the school through his work with Leaders of Tomorrow Youth Center. Maybin’s video of the frigid conditions experienced by students went viral after he posted it Wednesday. One of the students told Maybin that “yesterday I had frostbite” while sitting in a classroom with no heat, leaving the students wearing winter coats while attempting to learn in near-freezing temperatures. That led Maybin to endorse a GoFundMe campaign that began with a goal of raising $20,000 to purchase 600 space heaters and outerwear for students. As of early Friday, that campaign, led by Coppin State University senior Samierra Jones, had raised more than $41,000 from more than 1,100 donors. Another group is raising money to provide Mylar blankets to students. While outsiders make efforts to help the students, Baltimore officials and school administrators are pointing fingers about who is to blame for the burst pipes and broken boilers that have plagued the school system since students returned from break this week. Students got some relief on Thursday: Schools were closed because of the dusting of snow that hit the city. As city and school officials bicker, Maybin, a Baltimore native and an author, is helping with an effort seeking donations of coats, gloves, hats, thermals and socks for students. 12:03 AMSerena Williams announced on Thursday that she’ll skip the 2018 Australian Open, just a year after she won the 2017 event while eight weeks pregnant. And for tennis fans who expect dominance from the best women’s tennis player, that’s probably a good thing. A loss to Ostapenko shouldn’t be a complete disappointment — the 20-year-old native of Latvia won the 2017 French Open and was ranked as high as No. 7 in the world last year. Williams looked a little sluggish as she played her first competitive match in nearly a year. She gave birth in September 2017 to Alexis Olympia Ohanian Jr. It would have been an incredible story for Williams to defend her Aussie championship just one year after winning it while pregnant. Williams said she spent part of the exhibition match against Ostapenko worried about her 4-month-old daughter. “I was a little worried out there, and looked at my camp and I was like, ‘Is Olympia OK?’ But it’s really good,” Williams said during her postmatch interview. There was already a sign that Williams might not play in Melbourne: It was announced in December 2017 that she was booked to be the closing keynote speaker at a conference in Florida on Jan. 23. That event is happening during the Australian Open quarterfinals. The absence of Williams leaves yet another Grand Slam event wide-open. After Williams took a leave after winning the 2017 Australian Open, three women won the next three Grand Slam events, capped by Sloane Stephens winning the U.S. Open in September, her first major title. Williams now gets to spend more time with her daughter and husband, Alexis, whom she married last November. Her likely return: sometime before the French Open in May. Williams would be seeking her 24th career Grand Slam singles title at Roland Garros. 9:40 PMIn the words of Tarlaysia Hatch, the daughter of hip-hop artist Lil Boosie: I told y’all. On Thursday evening, the NBA released the first returns of fan voting for the 2018 All-Star Game, and lo and behold, who was the No. 1 vote-getter? The Milwaukee Bucks forward, who is second in the league in points per game (29.1), received 863,416 votes during the first 12 days that fan ballots were open. That total is 7,336 votes higher than the closest player, Cleveland Cavaliers forward and four-time MVP LeBron James (856,080) and 96,014 votes higher than the Western Conference leader, Golden State Warriors forward Kevin Durant (767,402), a regular-season and Finals MVP. Warriors guard Stephen Curry (735,115), a two-time MVP (and the first unanimous selection in league history), Oklahoma City Thunder guard Russell Westbrook (438,469), last season’s MVP after averaging a triple-double, and Houston Rockets guard James Harden (602,040), this season’s MVP favorite, all received fewer votes than Antetokounmpo. Which is to say the 23-year-old, backed by American and Greek voters (and possibly those from Nigeria, the birthplace of Antetokounmpo’s parents), is quite possibly the most popular player in the NBA. Who would have thought? For this year’s All-Star Game, the top vote-getter from the Eastern Conference and Western Conference will each serve as a captain and choose from a pool of the other players voted in for each team. As was the case last year, fan voting accounts for 50 percent, while current players and media members account for 25 percent each. Starters and captains will be revealed on Jan. 18, with reserves announced on Jan. 23. Two days later, on Jan. 25, rosters will be revealed, leading up to the All-Star Game on Feb. 18 in Los Angeles. The Plug, ‘Happy New Year’ (Episode 4): with special guest co-host Mike Golic Jr.
After taking time off for the holidays, it’s back to business for The Undefeated’s newest podcast, The Plug. Our country cousin Mike Golic Jr. fills in for me this week after being officially reported in the box score as “DNP — SUNBURNS” while having a tad too much fun in Colombia on vacation. Regardless, as they say in the industry, “the show must go on,” and it absolutely did. The quartet chopped it up on a multitude of topics, including Isaiah Thomas’ long-awaited comeback, the Rose Bowl and Sugar Bowl, one of the most provocative stories in sports right now — UCF’s undefeated season (no pun), and should they have been in the College Football Playoff — this weekend’s slate of opening-round NFL playoff games and the NBA All-Star Game rules changes. As always, subscribe to The Plug on the ESPN app! See you all next week! Previously: The Plug, ‘Pure Gold’ (Episode 3): Dave East closes out 2017 with one of the year’s best interviews. 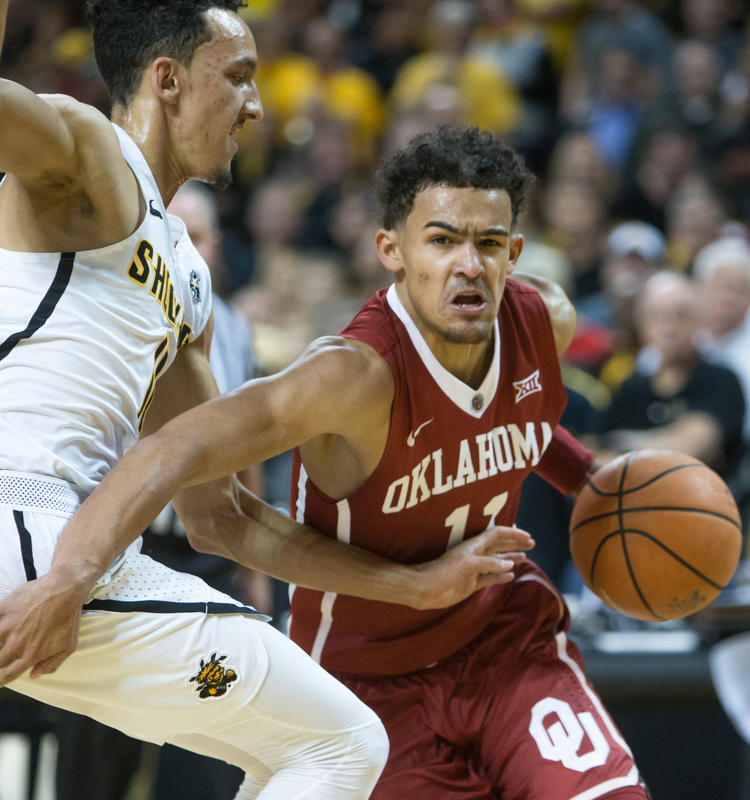 12:17 PMOn Wednesday night, Oklahoma’s phenomenal freshman Trae Young scored 27 points, dished out 10 assists and grabbed nine rebounds en route to a 109-89 victory over Oklahoma State. Even though the 6-foot-2 guard came up one rebound shy of a triple-double, which would’ve been just the fourth triple-double in school history, Young has been putting on a clinic all season for the seventh-ranked Sooners despite being the No. 23-ranked freshman in the nation coming into the season. His mix of creativity at the rim, crazy handles and I-don’t-care attitude behind the 3-point line makes him a natural comparison to two-time NBA MVP Stephen Curry, who lit up the nation during the 2008 NCAA tournament. But Young, through just 13 career games (three against Top 25 teams), is doing things even Curry couldn’t. Young is averaging 29.4 points, 3.9 rebounds and 10.6 assists per game. According to ESPN Stats & Information, since the 1983-84 season, the first year individual assists were tallied, only six players have averaged at least 10 assists a game. Of those six players, three (Southern’s Avery Johnson, Bradley’s Anthony Manuel and LIU Brooklyn’s Jason Brickman) also averaged better than 10 points a game. Manuel, whose 12 assists per game in 1987-88 were the second-highest total in NCAA history, averaged just 12.1 points per game that season (nearly 18 points fewer than Young), the most of the three. Young is having one of the best seasons ever for not only a point guard (The Ringer’s Mark Titus illustrates how he has surpassed every other point guard who has won the Wooden Award) but for any player in the past two decades. Oklahoma Sooners guard Trae Young (right). His 32 points and 10 assists against North Texas on Nov. 30 made him just the second player in Big 12 history to finish with at least 30 points and 10 assists. Young’s done it twice since. And just for fun, only three NBA players — Russell Westbrook, Oscar Robertson (five times) and James Harden — have averaged at least 29 points, 10 assists and 3.5 rebounds per game in a season. So, in short, the 19-year-old Young may be the best college basketball player we’ve seen in decades, and we may not have not seen anything yet. 2:06 AMIn the waning moments of Grambling State’s 93-71 win over Alabama State on Wednesday night, the Tigers’ Shakyla Hill solidified her place in NCAA women’s basketball history. With Hill’s assist to Monisha Neal for a 3-pointer, Hill became the first player to finish with a quadruple-double in almost 25 years, as well as the first player (male or female) from a historically black university and the fourth woman overall to complete the feat. The junior guard finished with 15 points, 10 rebounds, 10 assists and 10 steals. Hill helped push the Tigers’ (5-8, 2-0 Southwestern Athletic Conference) 40-33 halftime lead to double digits against the Hornets (2-11, 0-2) with her 11 points, 7 rebounds, 7 assists and 6 steals after the break. Arkansas State’s Sonja Tate was the last woman to record a quadruple-double when she amassed 29 points, 14 rebounds, 10 assists and 10 steals against Mississippi Valley State on Jan. 27, 1993. On Jan. 14, 1991, Lamar’s Ramona Jones had a quadruple-double — 10-10-10 and 12 steals — against Central Florida. Two years earlier, on Jan. 14, 1989, Veronica Pettry of Loyola Chicago finished with the first official quadruple-double in women’s Division I history with her 12 points, 10 rebounds, 22 assists and 11 steals. And unofficially, Louisville’s Jackie Spencer finished with the very first quadruple-double in Division I NCAA history with her 12 points, 12 rebounds, 14 assists and 10 steals against Cincinnati on Feb. 2, 1985. It would take two more years for steals to be considered an official NCAA stat. 9:28 PMSpeedskater Shani Davis, the first African-American to win an individual gold medal at the Winter Olympics, qualified for Team USA on Wednesday, marking his fifth straight appearance at the Winter Games. Davis finished second (1:09.23) in the 1,000-meter race at the Olympic trials in Milwaukee, solidifying his spot on the team ahead of February’s games in Pyeongchang, South Korea. Joey Mantia, a 2014 Olympian, came in first (1:09.15), and two-time Olympian Mitch Whitmore rounded out the top three (1:09.31). A Chicago native, Davis began roller skating at 2 years old, eventually leading to his making the U.S. junior national team in 1999 at age 16. In 2002, he made his first Olympics as an alternate for the short track team. Four years later, he placed first in the men’s 1,000 meters, becoming the first black athlete from any country to win an individual gold medal at the Winter Olympics, and second in the men’s 1,500 meters. In 2010, he won another gold (1,000-meter) and silver (1,500-meter) medal, and Davis is a seven-time world champion in both events. Davis is one of the best-known black Winter Olympians, joined by bobsledder Vonetta Flowers, the first black Olympian to win a gold medal (in a team event), and figure skater Debi Thomas, the first African-American to medal at the Winter Olympics. Other black athletes joining Davis in Pyeongchang will be hockey player Jordan Greenway, the first African-American to play for Team USA; the Nigerian women’s bobsled team, the first team from an African nation to qualify in the event; and fellow American speedskater Maame Biney, 17, who in December became the first black woman to qualify for a U.S. speedskating team. Davis, who turned 35 in August, recently told the Team USA website that he plans to continue racing until he can no longer skate. 4:13 PMArt Dorrington, who signed with the New York Rangers organization in 1950 to become the first black professional hockey player in the United States, died on Dec. 29, 2017, in Atlantic City, New Jersey. Dorrington played for the Atlantic City Sea Gulls, Johnstown Jets, Washington Lions and Philadelphia Ramblers after moving around the Eastern Hockey League (EHL), Eastern Amateur Hockey League (EAHL) and International Hockey League (IHL). He was drafted into the Army in 1956 and spent 22 months overseas before briefly returning to hockey. A broken leg ended his career. He never got called up to the Rangers. The NHL wouldn’t see its first black player until Boston Bruins forward Willie O’Ree broke the color barrier in 1958. Dorrington was born in Truro, Nova Scotia, Canada, and rose onto the Rangers’ radar thanks to his high-scoring ability. He signed his pro contract the same year the NBA welcomed its first black players. He tallied 163 goals and 157 assists in 345 EHL, EAHL and IHL games. Dorrington was pegged as the “Jackie Robinson of hockey” on a trading card. “He was a true champion. He had a major impact on this city,” Dorrington’s daughter, Judah, told The Press of Atlantic City. In 2012, Boardwalk Hall’s ice hockey rink was named after Dorrington, and three years later, Atlantic City Mayor Don Guardian proclaimed March 15 as Art Dorrington Day. 1:31 PMJordan Greenway, a forward for Boston University and a 2015 second-round draft pick of the NHL’s Minnesota Wild, will be the first African-American to represent Team USA in hockey at the Winter Olympics. Greenway made the cut this week as the U.S. announced its men’s and women’s rosters for next month’s Olympics in Pyeongchang, South Korea. The 20-year-old is one of four collegiate players who will represent the country. Out of 1,690 men’s Division I college hockey players, only 13 have identified themselves as black. Greenway’s selection was propelled by a stellar performance in the 2017 International Ice Hockey Federation World Junior Championship in Canada. 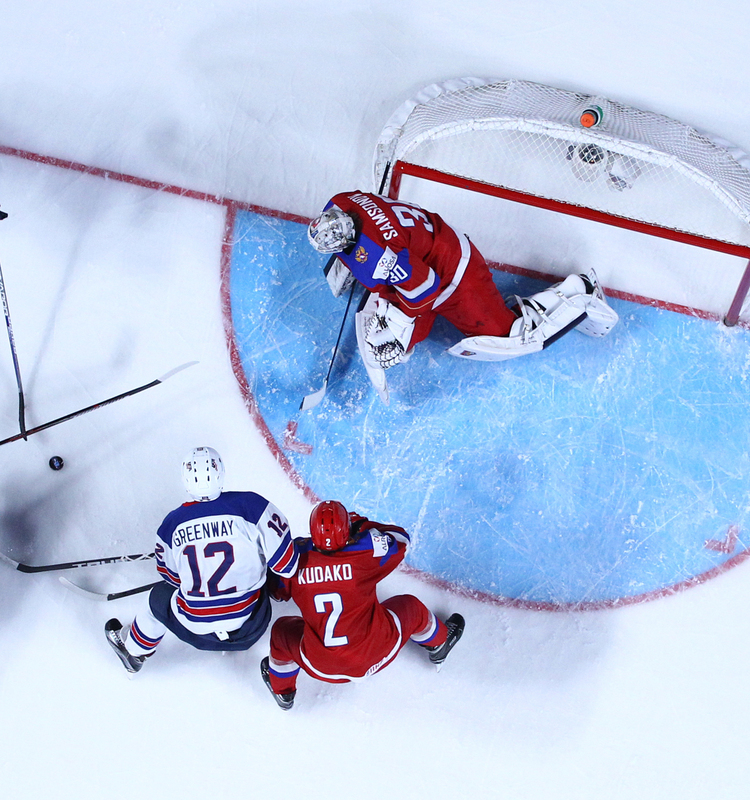 Greenway had three goals and five assists in seven games for the gold medal-winning U.S. team. The 6-foot-5, 235-pound junior from Canton, New York, has amassed seven goals and 10 assists in 19 games with Boston University this season. Years of self-determination led to this moment for Greenway. When he was 12, he went to his mother about going to a hockey prep school and getting out of Canton. She told him to research the top five programs and fill out the applications. As a family they would visit the schools, but Greenway’s mother told him he needed to take the lead on the process. The deal she struck with Jordan and his brother, James, was that if she paid for prep school, they’d have to earn scholarships for college. Jordan Greenway was teammates with Auston Matthews, Noah Hanifin, Zach Werenski, Matthew Tkachuk and Clayton Keller on the United States National Development Team Program in Ann Arbor, Michigan, after playing three years at Shattuck St-Mary’s School in Faribault, Minnesota, the top prep hockey program in the country. James Greenway, who also went to Shattuck St-Mary’s, is a sophomore on the Wisconsin men’s hockey team and a 2016 third-round draft pick of the Toronto Maple Leafs. For the first time in 30 years, the NHL won’t send any of its players to the Olympics, so the U.S. roster is mainly composed of overseas, minor league and retired talent. Should the Raiders get a pass on the Rooney Rule? 12:22 PMAfter I wrote a commentary Tuesday critical of the Oakland Raiders, who have seemingly gone around the Rooney Rule to pursue a reunion with former head coach Jon Gruden, several people on Twitter went at me about the franchise’s groundbreaking hiring record. Al Davis, the Raiders’ longtime principal owner and general manager until his death in 2011, was definitely a champion of diversity. In 1979, Davis promoted assistant Tom Flores, who is Latino, to head coach making him the league’s first minority head coach to win a Super Bowl and then a second one. Then in 1989, Davis made Art Shell, a Hall of Fame offensive lineman with the Raiders, the first black head coach in the modern history of the NFL. In 1997, Davis appointed Amy Trask the team’s CEO. Until she resigned in 2013, Trask was a member of a very rare club as one of the most powerful women in professional sports. Davis was a maverick. He also was a trailblazer among owners when it came to hiring. Davis’ son, Mark, hired Reggie McKenzie, who’s African-American, to be the team’s general manager. Yep. The Davis family has been much more progressive than other owners. And that has absolutely nothing to do with the current situation. Both things are true: Flores, Shell and Trask were impressive hires. The Raiders also have skirted the Rooney Rule to rehire Gruden, a move that appears imminent. Sure, the Raiders will likely interview a candidate of color, but that candidate has a zero percent chance of getting the job. That’s making a mockery of the rule. On Tuesday night, Trask took to Twitter with her position on the issue. The past has nothing to do with this week’s events, she wrote. (2/2) be forthright and choose to pay a fine. But I don’t believe that Al’s legacy should be used as justification for non compliance – Al hired Tom and Art and me – and Al would be the first to be saddened if it was. Should the Raiders get a pass on the rule because of their hiring history? Tell us what you think.